New York baker Jim Lahey’s revolutionary no-knead bread recipe was made famous across the land after “The Minimalist” Mark Bittman introduced us to the Euro-style loaf in 2006. Cook’s Illustrated later tinkered with that recipe, adding more salt and a hit of lager, renaming their version “almost no-knead bread.” Since then, I’ve recreated the recipe umpteen times — and encouraged you to do so (with how-to photos!) right here on the blog. Today, I’m going to again insist that you try your hand at a no-knead recipe. This time I won’t take “no” for an answer. Why? Because everyone kneads to know how to bake a great loaf of homemade bread. And thanks to Lahey’s new cookbook “My Bread” (and its wide world of no-knead recipes), I’ve got another great recipe for you to try. Last weekend, in advance of Saint Patrick’s Day, I delved into “My Bread” for the first time and found Jim’s Irish Brown Bread. Just my luck, it’s magically delicious! 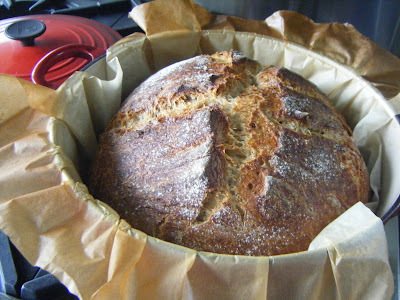 My Bread: Now, there’s a brown bread recipe that lives up to its name. Go buy the book. I did. At $29.95, it may seem expensive, but compared to a half-dozen loaves of bakeshop bread at $5 a pop, trust me: in the long run, it’s an absolute bargain. 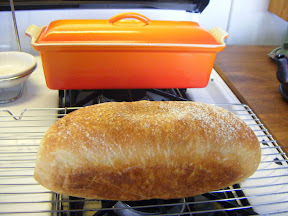 In addition to step-by-step photos of the basic no-knead bread recipe (and many others) Lahey offers a detailed explanation of how the bread-making magic occurs, explaining the miracle methodology behind the slow-rise dough and his “oven within an oven” technique: baking the loaf in a sturdy covered pot. His preferred vessel is an all-ceramic (and admittedly expensive) Emile Henry, though as he points out, you’ll do fine with an inexpensive pre-seasoned Lodge cast-iron pot. 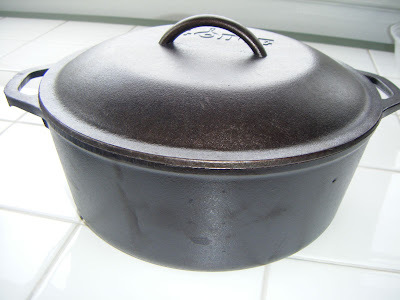 My classic Lodge cast-iron Dutch oven. The baker developed many of his recipes using an enameled cast-iron 5 1/2-quart Le Creuset, which is my go-to bread-baking pot. And I regularly double the recipe to make a single large loaf in that very pot. In fact, the one pictured at the top of this post is a double-loaf, which takes no more or less time to bake than the smaller one. I’ve also experimented — with great results — with my entire battery of Le Creuset, using everything from a 3 1/4-quart blue oval, to a rectangular terrine pan (great for making “kid-size” sandwich bread), to the 7 1/4-quart whopper generally reserved for big batches of Sri Lankan beef curry, spaghetti Bolognese, or Mac’s favorite minestrone. This is about a third of a doubled recipe. Enough for dinner, plus toast and sandwiches the next day. My Wonder! Kids love this bread, too. 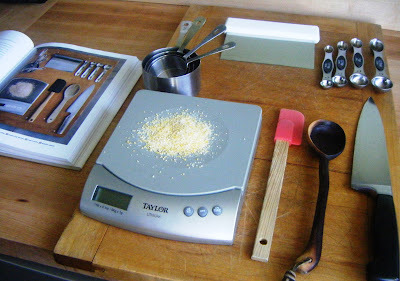 I’ve got a scale — used here for artistic purposes — but I rely on my measuring cups, spoons and eyes when baking bread, an enjoyable exercise far more forgiving than cake baking. 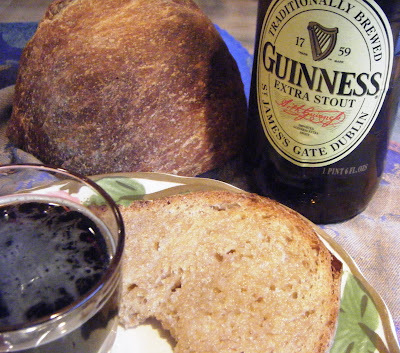 Unlike his basic recipe, which calls for nothing more than flour, water, salt, yeast, and the most important ingredient — time — Jim’s Irish Brown Bread requires a healthy dose of Guinness and another of buttermilk. And though that recipe, spelled out below, does not make use of Cook’s Illustrated’s addition of parchment paper (which greatly helps with ease-of-delivery into and out of the very hot pot), I used it anyway and suggest you do the same. Today’s, what? Thursday? I baked the loaf last Sunday, kept it wrapped in a kitchen towel since then, and it’s still fresh tasting. I toasted a nice slab for breakfast, and now I’m thinking: Next week? No-knead rye bread — which should taste pretty good with a couple nice thick slices of slow-braised corned beef. Are you for us, or a Guinness? The breakfast of champions. 1. In a medium bowl, stir together the flours, salt, wheat bran and yeast. [I use a whisk to better distribute the dry ingredients.] Add the beer and buttermilk and, using a wooden spoon or your hands, mix until you have a wet sticky dough, about 30 seconds. Cover the bowl and let sit at room temperature until the surface is dotted with bubbles and the dough is more than doubled in size, 12 to 18 hours. 3. Place a clean tea towel on your work surface and generously dust it with wheat bran or flour. Gently place the dough on the towel, seam side down. If the dough is tacky, dust the top lightly with wheat bran or flour. Fold the ends of the tea towel loosely over the dough to cover it and place it in a warm, draft-free spot to rise for 1 to 2 hours. The dough is ready when it is almost doubled. If you gently poke it with your finger, it should hold the impression. If it springs back, let it rise for another 15 minutes. 5. Using pot holders, carefully remove the preheated pot from the oven and uncover it. Unfold the tea towel and quickly but gently invert the dough into the pot, seam side up. Use caution — the pot will be very hot. [Conversely, lightly oil a large piece of parchment paper with cooking spray and invert the dough onto the parchment. Lift it and gently place into the hot pot, leaving a good couple inches hanging out the sides of the pot.] Cover the pot and bake for 30 minutes. 6. Remove the lid and continue baking until the bread is a deep chestnut color but not burnt, 20 to 30 minutes more. 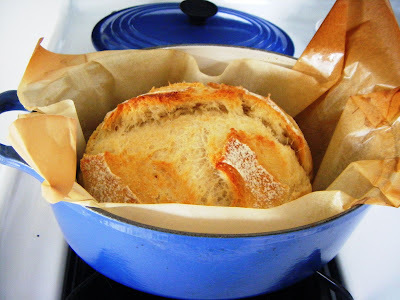 Use a heatproof spatula or pot holders to lift the bread out of the pot [or, if you used parchment, gently lift the loaf out using the edges of the paper]. Place on a rack and cool thoroughly. 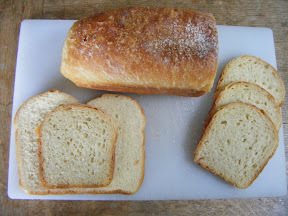 Recipe from “My Bread: the revolutionary no-work, no-knead method” by Jim Lahey with Rick Flaste (Norton). So tell me: Have any of you tried this, or any other no-knead recipe? What do you think? Am I right or am I right?